St. Ignatius of Loyola (the founder of the Jesuits) developed a retreat experience that is called the Spiritual Exercises. This experience intends the growth in relationship with God through a process that involves four phases. The process leads toward living a life of greater love of God in the world. The liturgical seasons of Lent and Easter invite reflection on the third and fourth phases. The Church’s liturgy during the Triduum (Holy Thursday to Easter Sunday, three days) offers an important transition, moving from phase three to phase four. This transition helps recognize what Jesus Christ is doing in the world. His presence and concern for those who have grown to love him as he suffers and dies is no small gift. His forgiveness and compassion for those who choose to oppose him and remove him from worldly experience is remarkable. Jesus Christ in his resurrection leads to new life and an offer of love that knows no bounds. During the Triduum, imagine what it would be like to have Jesus wash the feet of your friends, or even your feet. What would that be like? Imagine walking along with the crowds as they accompany Jesus on the way to his death on the Cross. What would that be like? As Jesus is taken off the Cross, people are wondering about a tomb for him. What would that conversation be like? Jesus Christ risen appears to some companions who share it with others. The others find it hard to believe. What would it be like to watch that conversation? What would it be like to be in that conversation? The risen Jesus stands among his friends. What would that be like? Growing in awareness of being with Jesus in his time helps growth in awareness of Jesus here and now. The invitation and challenge is to imagine time with Jesus in the busy life at work and at play. Jesus is alive in the relationships of today. Growth in awareness of the Risen Jesus offers a newness of life that leads to a love that knows no bounds. May you know God’s abundance each day through Easter and beyond. Adoration takes place from 8 a.m. to 2 p.m. on Fridays in the Skinner Chapel. Click HERE to reach the CP Adoration 2018-2019 signup page where you can view the adoration schedule and sign up to participate. If you have any questions about Eucharistic Adoration at Prep, please contact Mr. Kelly Barth at kbarth@creightonprep.org. Thank you for considering to serve the Prep students and the faculty and staff in this way. God bless you! 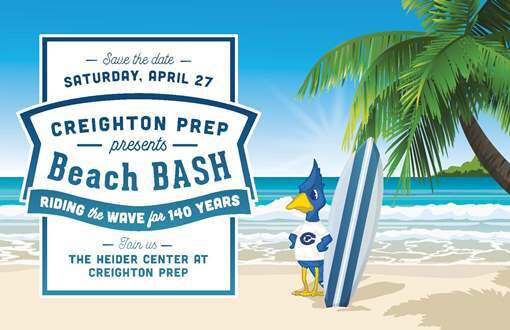 In just 10 days on Saturday, April 27, our most important fundraiser of the year, Beach BASH 2019 “Riding the Wave for 140 Years,” will take place in the Heider Center, and your attendance and support through bidding that night is key to making it a success for our students. Please be one of those making a difference for them at Beach BASH 2019. Click HERE to register to attend, and help us reach our goal of having 900 enthusiastic Prep fans there! Individual tickets are $150 per person ($90 tax deductible), and young alums (Class of 1998 and later) can purchase tickets at $75 per alum plus guest ($15 tax deductible). Family tables of 10 are $1,500 and corporate tables start at $1,600. We're also happy to place you at a table if you don't have plans to fill your own. While the catalog for Beach BASH 2019 will be hand-delivered to guests prior to Saturday, April 27, you can view a PDF version now via the links below. Review all the great live, super silent and silent auction items, and get your bidding strategy in place well before the evening begins! We’re also pleased to include the names of the volunteers, auction donors, advertisers, corporate table sponsors and underwriters who made Beach BASH 2019 possible. Click HERE to view the entire catalog for Beach BASH 2019. Live Far from Omaha? Bid During the Live Auction via Proxibid. 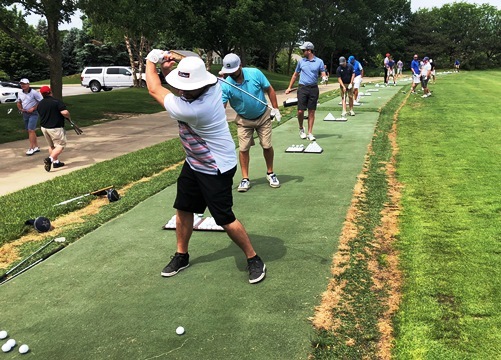 If you live far from Omaha and cannot attend Beach BASH 2019, you can still be part of the success by bidding with Proxibid during the live auction portion of the evening. Click HERE to sign up with Proxibid then return to the site on Saturday, April 27 at 8 p.m. CDT to bid on a great collection of trips, dinners, sports experiences and other items. We still need a number of adult volunteers to help with the setup of silent auction displays, auction and centerpiece tear down, and post-event cleanup. Adults can sign up here. Has your son registered to volunteer that evening? If not, please encourage him to do so. We’re still in great need of dinner servers/waiters and also raffle ticket sellers and BidPal Geniuses. Students can sign up here. 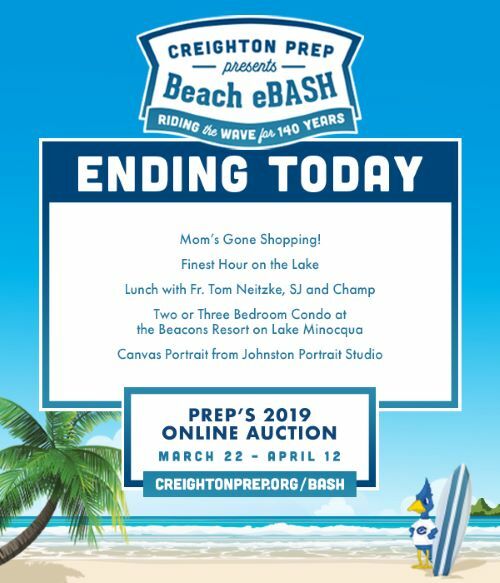 BASH is Prep's largest fundraising event of the year and, with your help on Saturday, April 27, we can make it a success for our deserving young men! We are looking for teachers in math, English/Language Arts and science for sixth-through-eighth-grade boys during mornings Monday through Friday from June 3-28. Compensation is competitive, offering $3,000 per subject area for teaching three sections – one section per grade level. Adjustments will be made if the candidate is not able to teach all three sections. Candidates with experience in either junior high- or high school-level teaching are preferred. Congratulations to the four seniors and 71 juniors who were recently inducted in the John C. Naatz Chapter of the National Honor Society at Creighton Prep. The inductions took place at a 3 p.m. ceremony on Sunday, April 14 in the Sullivan Center. Inductees were selected for their demonstrations of scholarship, service, leadership and character. Those in attendance were welcomed by senior Carson Broz, who also led the new members in the NHS pledge, then Creighton Prep President Fr. Tom Neitzke, SJ offered a prayer and opening remarks. Certificates were presented by Head of School Jim Bopp and Academic Principal Joe Ryberg. Congratulations to the following Prep students on their second place finish at this year's Tests in Engineering Aptitude Math and Science (TEAMS) competition! Awesome! Congratulations to the Creighton Prep Concert Band on receiving a Superior Plus rating in the recent district music contest. This marks the 33rd consecutive Superior rating in the program’s history, the longest active streak in the state of Nebraska. The choir also performed especially well and received an Excellent rating. Bravo also to the Prep Percussion Ensemble on its first Superior rating, to marimba soloist Liam Doyle on his Superior rating and to soloists Will Ernatt and George Lee on their Excellent ratings in trumpet. 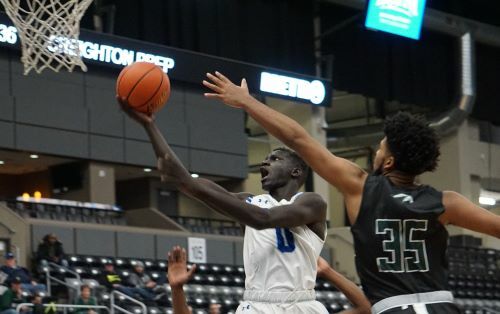 Congratulations to senior Akol Arop on receiving a 2018-2019 Winter Scholar Athlete Award from the Greater Omaha Sports Committee during a luncheon on Wednesday, April 10 at the Hilton Omaha downtown. Akol will continue his academic and athletic pursuits at the University of Nebraska, and will play basketball for the Huskers. The Carta Hall of Fame Room was the location on Wednesday, April 10 for a national letter of intent signing ceremony for two Prep seniors. 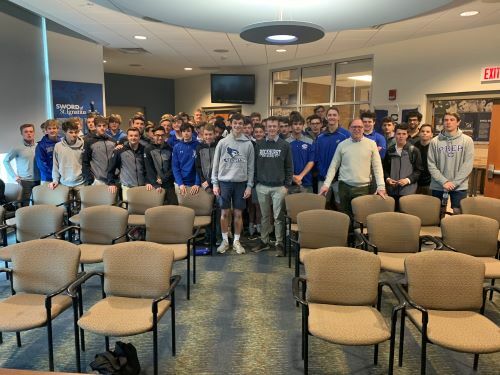 At the event, Spencer Jonas announced that he will attend and play baseball for Rockhurst University, and classmate Luke Waters declared his intention to attend and play soccer at Creighton University. Congratulations, guys! Speech and Debate Team Members Advance to Nationals. The speech and debate team includes two students who finished the season with double-qualification status, the highest credential awarded by the National Forensic League/National Speech & Debate Association. Congratulations to sophomore Dominic Mendlik who was the champion of the House of Representatives Congressional Debate and senior Jaliya Nagahawatte who placed second in the Senate. Both advance to national competition in June. Speech and debate team member Jaliya Nagahawatte ‘19 recently became the third Prep student this decade to win the state championship in Congressional Debate competition at Millard South. Sophomore Dominic Mendlik took third, and Prep placed third in the team sweepstakes competition. Jaliya also placed third in extemporaneous speaking at the state speech tournament at the University of Nebraska at Kearney. Congratulations to the 6805 CyberJays robotics team from Prep on their ninth-place finish at the 36-team FIRST Robotics Competition (FRC) Greater Kansas City Regional held March 20-23. “This was an impressive performance for a Prep program just beginning its second year of FRC matches, especially a team comprised mostly of freshmen and sophomores,” said faculty moderator Rich Mansfield. “I’m very proud of the boys for making it to the semifinals and for choosing the 5809 Jesubots from our brother school Rockhurst High School as one of their Alliance 6 partners. A fine team that received the Entrepreneurship Award." CyberJays members include freshmen Mason Atkin, Bryce Frailey, Connor Johnston, Augie Larsen, Aiden O’Connor, Nathan Smith and Nick Wilson along with sophomores Andrew Hood, Tom Knudsen, Kevin Prososki, Josh Royal, Cal Tietjen, Cian Weekly and Abram Wulf, and seniors Elwyn Frailey, Will Randby and Luke Reinsch. All mothers of sons currently attending Prep are cordially invited to the Prep Moms spring retreat, which will take place on Tuesday, April 23 from 7-9 p.m. in the Sullivan Center. Click HERE to sign up to attend and to bring something for the potluck or to help with setup or cleanup. Director of Adult Spirituality Fr. Kevin Schneider, SJ will begin the evening with a short service. That will be followed by a brief discussion of meeting agenda items then the potluck gathering. Please stop by to celebrate all of your important contributions to the current school year at CP and to welcome our 2019-2020 president Lisa Gravelle. Signups for next year's committees and events will also be available at the retreat. Click HERE to register today, and contact Max Huerter '09 in the Alumni Office with any questions at mhuerter@creightonprep.org or 402-548-3851. 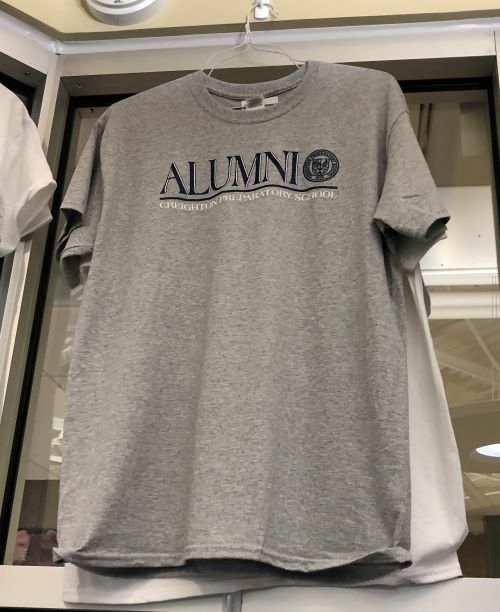 If you are a Prep alumnus from a class year that ends in “4” and “9,” be sure to join us for Reunion Weekend 2019 on Friday and Saturday, September 20 and 21. Details are still being finalized but please note that Preptoberfest 2019 is also planned for Saturday, September 21. If you would like to help with the planning of your 2019 class reunion, please contact Director of Alumni Relations Max Huerter ’09 at 402-548-3851 or mhuerter@creightonprep.org. Please remember the recently deceased members of the Creighton Prep community noted HERE. The Alumni Office will post a notice of the passing of Prep alumni, parents, spouses and children each month with the Prep Pulse. If we have missed a notice or you wish to receive further obituary information, please contact Terri Haller at thaller@creightonprep.org.